I’ve noticed that there are always a few foods that show up, without fail, at the American summer picnic-hot dogs, hamburgers, baked beans-and potato salad. Or maybe it’s an Ohio thing. Whatever. It’s my humble opinion that a girl needs to know how to make a good potato salad if she wants to throw a legitimate summer party. So maybe we bring potato salads to summer picnics to give us strength for more swimming and baseball and the like. The recipe I chose to make is a very simple one and comes from one of the first recipe books devoted exclusively to salads. It’s simply called Fifty Salads, published in 1885, by Thomas Jefferson Murrey-and despite an extensive internet search, I could not figure out if he is actually descended from Thomas Jefferson. So if anyone has a resource that proves it, let me know. These are the things that bug me! Beautiful and simple, this recipe is perfect for summer picnics where refrigeration is a concern. I loved this recipe-so did my family and so did the guests of my first summer get together. It’s so easy you can put it together in no time flat. It is an oil-based salad and if you’re a fan of the mayonnaise and mustard type, I urge you to try it anyway, because I think you’ll be pleasantly surprised! 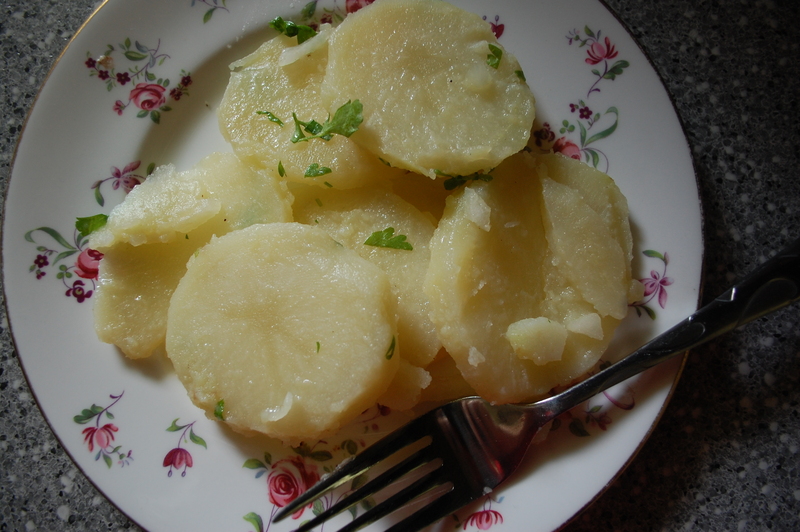 Slice your potatoes thin, but no so thin that they’ll fall apart when boiled. 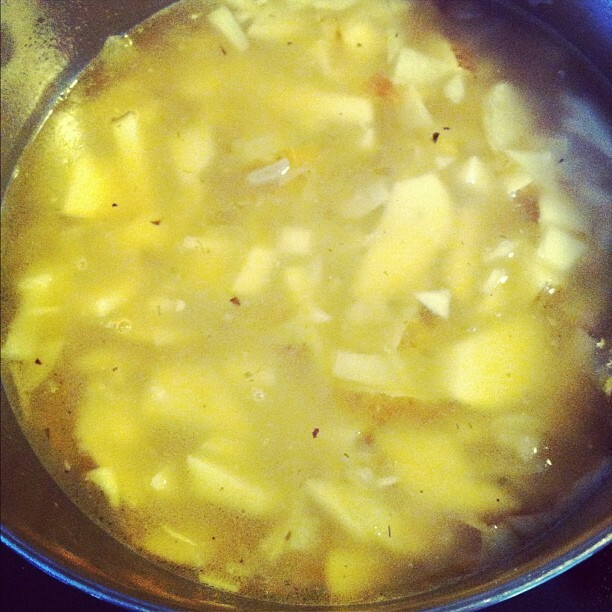 Boil the potatoes in a medium saucepan on high heat *until just tender*. You must be sure you don’t overcook them-you don’t want the slices falling apart. Remove from the heat and drain. Really delicious-and you can use leftovers on your lettuce salads. Meanwhile in a small bowl, combine the salt, pepper, olive oil and vinegar. Whisk together well. Bonus: I got to use the parsley that Ella and I planted in April. There is nothing so tasty as fresh herbs! 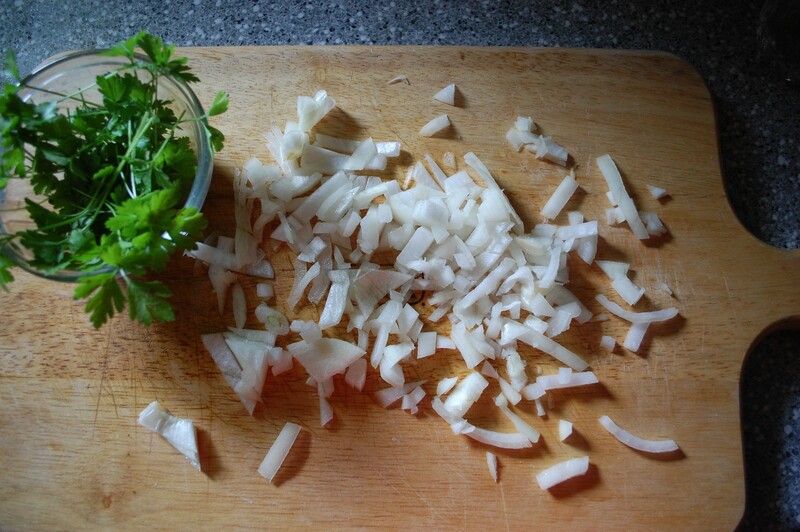 Place the onions and parsley in the bottom of a large bowl. Pour the potatoes on top of that. Spoon the dressing over the potatoes, a tablespoonful at a time. NOTE: you may not need all the dressing you prepare. For my batch, I stopped at six tablespoonfuls and just saved the rest in the refrigerator for a salad later. You don’t want it to be too oily. Toss it and go with your gut. That’s it! It works warm or cold, however you prefer. Beautiful, delicious, simple and elegant. 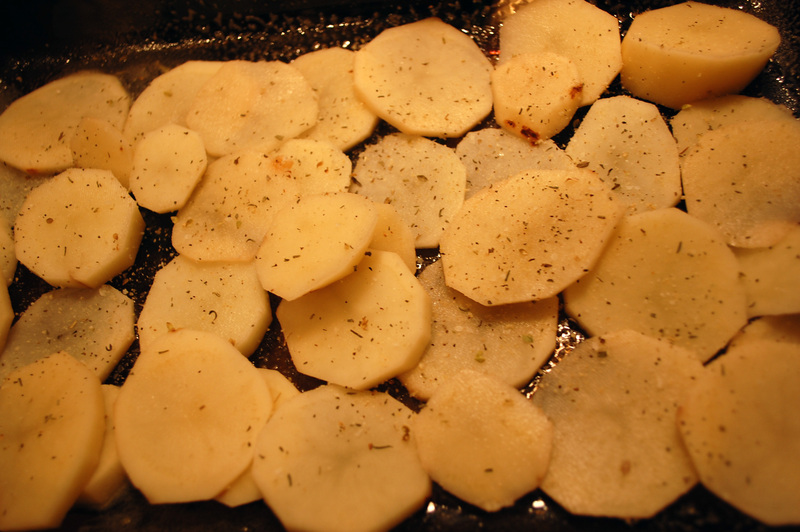 While putting together my menu for my vintage dinner party, I made a vow to include a potato dish for my husband, who is not a lover of salad or eggplant. This is a super easy recipe appropriate for solving that common post-family dinner problem-what to do with all those leftover mashed potatoes! 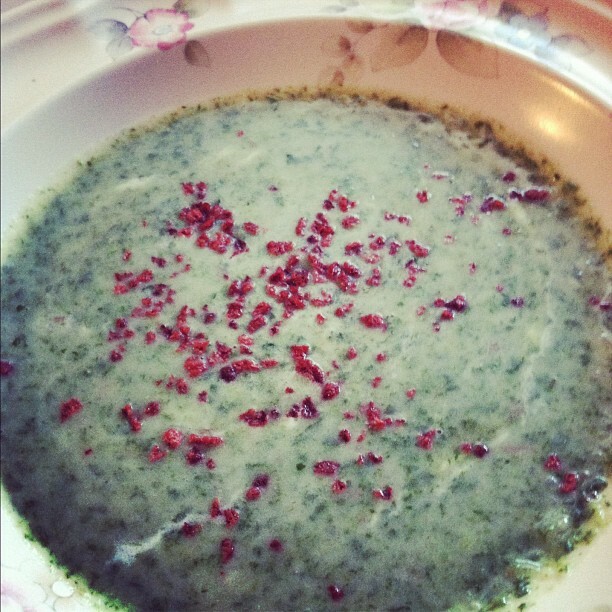 The recipe comes from Dr. Allinson’s Cookery Book, published in 1915. Thomas Allinson was a British doctor who advocated the vegetarian diet and the consumption of whole-grain breads. Chop onion fine and mix it in a large bowl with the potatoes. Add the rest of the ingredients. Ingredients, ready for mixing. You’d think the nutmeg would be a weird addition but it gives the “dough” a unique flavor! My friend Jen demonstrates how to separate an egg yolk and white without an egg separator. Basically, you just juggle the egg between the two halves of the shell until all the white is removed. Roll the mixture into balls, about 2-3 inches round and place on greased cookie sheet. Brush over them with pastry brush dipped in melted butter and bake at 400 degrees for 10-20 minutes. 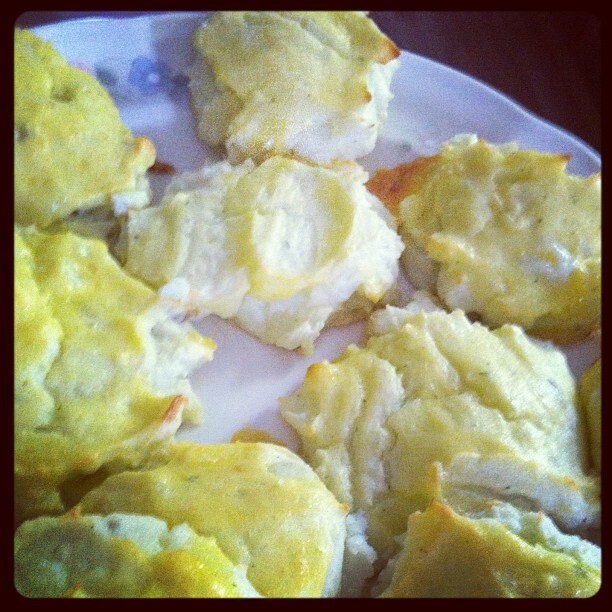 Potato, or po-ta-to… they’re cute and easy! 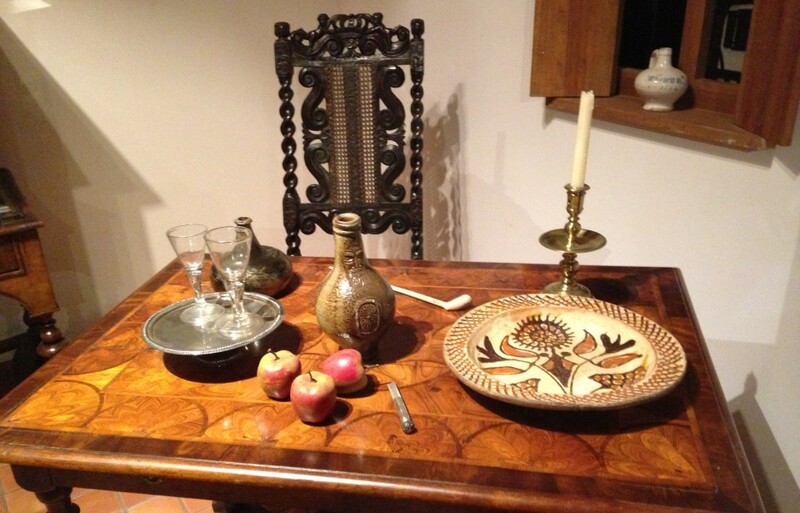 When I was in the midst of trying to choose recipes for my vintage dinner party, I received a Facebook message from a high school friend named Mark who shares my love of history, nature, and food. He’s an accomplished cook, gardener, canner and fisherman and his recipes are like little treasures. Mark included a lovely recipe for pastys. A pasty is basically a pot pie you can carry. I hope he doesn’t mind, but I included his explanation of the history of the pasty because, before this, I’d never heard of them! Our family had cabins in the UP of Michigan growing up. Whenever we went North, the trip was not complete until we had each had a trifecta of the UP… a beef pasty, a smoked whitefish, and a good hung of maple walnut fudge from Mackinac Island. We stayed in Cadillac, in mid Michigan this year, and I found a store like the ones in the UP when I grew up that sold traditional Pasty (traditional has to have rutabaga), We all had some and my wife said you need to do this, you can do this. The kids love them too. I thought you would enjoy it. They were originally brought to Michigan by the Cornish miners. , I believe. Definitely a hardy filling dish that can be varied depending on what you have around-basically, hardy root vegetables mixed with ground meat in a pastry crust. I have had them with turnips, parsnips, onions, rutabaga, potatoes, sweet potatoes, etc… There is also a way to make these a two course where there is a main meal in two-thirds of it and a desert filling in the last one-third, separated by a wall of dough…I am sure you can do much with this recipe! Mark included a photo of his batch of pastys-which, by the way, were way prettier than mine-I decided that this would make a great second entrée for the dinner. Mark’s recipe comes from the March 28, 1943 edition of the Milwaukee Journal. 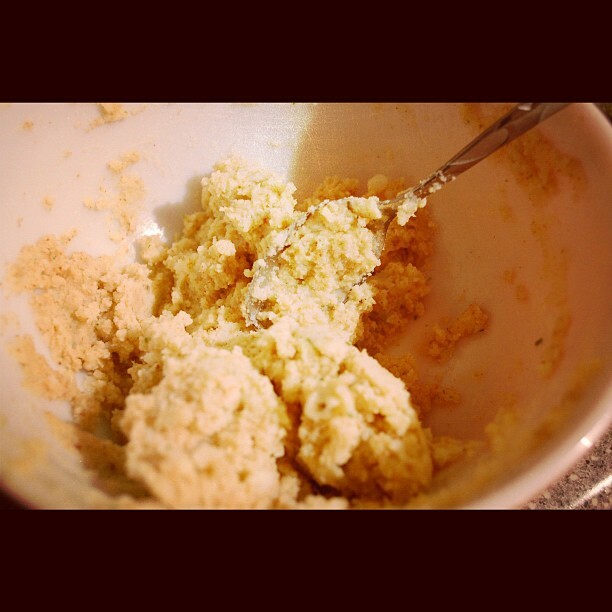 In large bowl, combine flour, butter, and 1 ½ teaspoon of the salt. Blend until well combined and add water, one tablespoon at a time, to form a dough. (I had to add an extra tablespoon). Dough, just before I formed it into a ball. Toss mixture until it forms a ball. 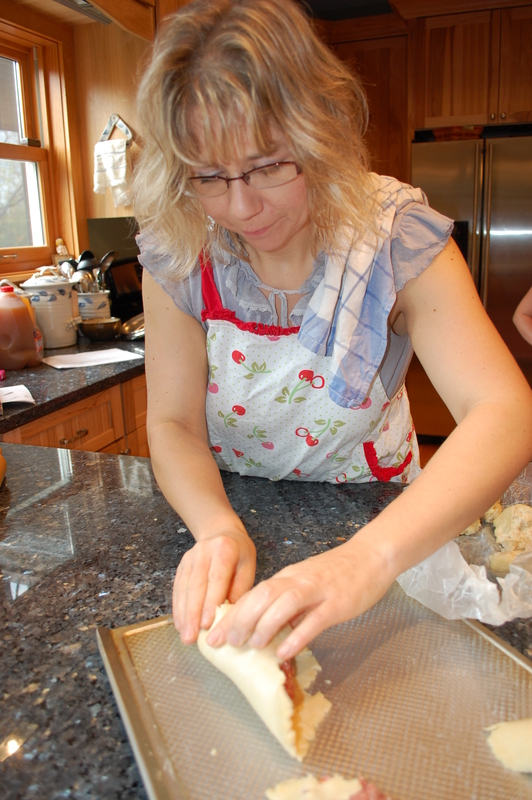 Knead dough lightly on smooth surface with heel of the hand to distribute the fat evenly. Form into a ball, dust with flour, wrap in wax paper and chill for at least 30 minutes. Meanwhile, combine meat and vegetables plus remaining salt (2 teaspoons) and pepper in a large bowl. When the dough is chilled, preheat your oven to 350 degrees. Divide dough into six pieces. Roll each piece into a 10 inch round on a lightly floured surface. Put 1 ½ cups of filling on half of each round. Moisten the edges and fold over to enclose the vegetables. Pinch the edges together and crimp with fork. Cut several slits in top. Repeat for the other pieces of dough. Bake pastys on a lightly buttered baking sheet for 30 minutes. 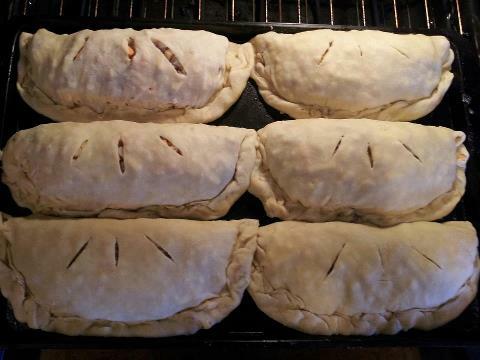 Place 1 teaspoon butter through a slit in each pasty and continue baking for 30 more minutes. Remove from oven, cover with damp tea towel, and cool for 15 minutes. Not as pretty as Mark’s but still tasty. Mine look rustic… yea, that’s it! The pastys at the party got rave taste reviews, especially from the guys! Enjoy! 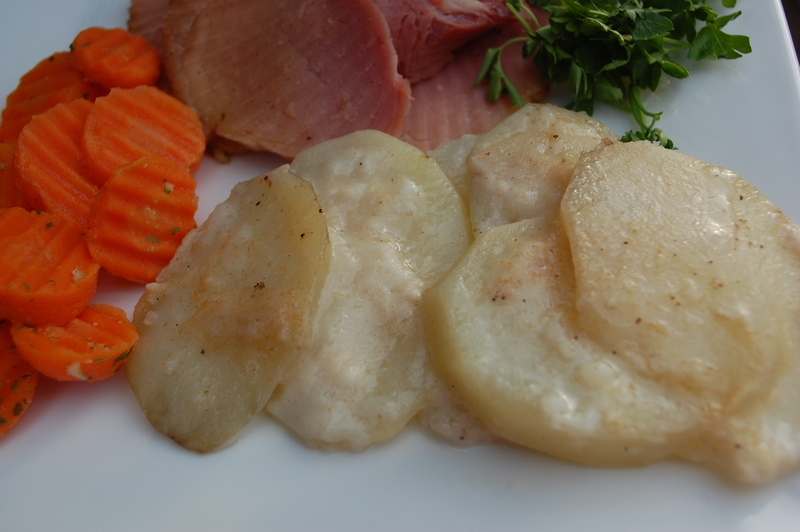 Here is the second in my series of recipes that use leftover mashed potatoes. When I saw this, I just knew I had to try it. Who doesn’t love a good, homemade doughnut? You cannot taste the potato in this recipe. And this makes A LOT of doughnuts, so one batch will feed a family of four plus some for breakfast. I had two issues with the recipe. 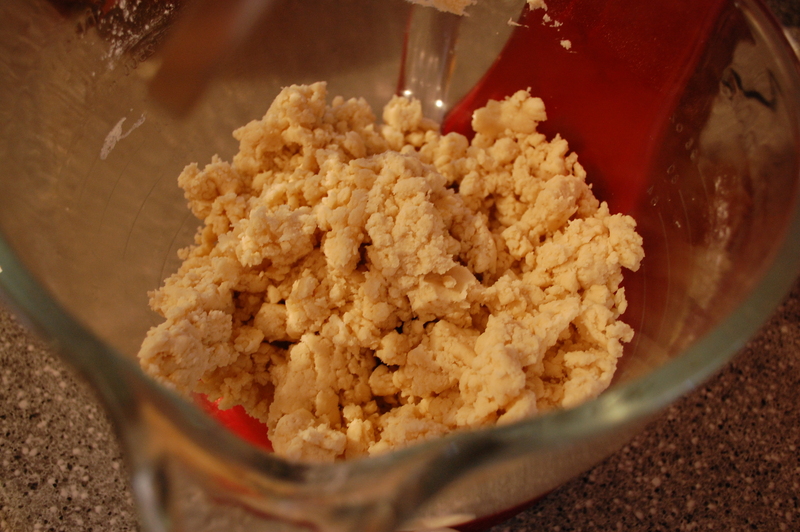 First, the dough, once mixed, is very sticky. I ended up adding another cup of flour to it on my own. I DID NOT add that into main recipe ingredients, as many factors, including weather, can affect dough constituency. I believe it is better to add flour to dough than to try to correct overly dry dough. With that in mind, have an extra cup of flour ready and add it, in small portions, until the dough is soft but still firm enough to roll. You can either add the flour in the mixing bowl or work it into the dough with your hands on the rolling surface, which is what I did. Also, I did not have a doughnut cutter so I had a little issue with the shape. After some experimentation, I ended up cutting a large round with a parfait glass-and the hole with the champagne glass. Still, I had trouble transferring my rings to the oil and they became funny shapes but, no matter. They tasted GREAT. And nothing says homemade like food that doesn’t look professional-or at least that’s what I tell myself. This recipe comes from Pennsylvania Dutch Cooking, published in 1935. Preheat oil in a frying to 365 degrees. 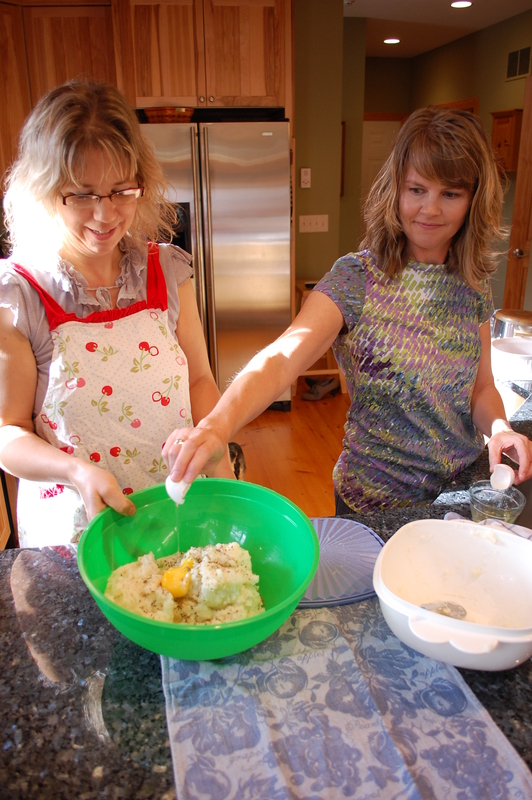 Mix mashed potatoes, shortening, eggs, and milk in large mixing bowl until thoroughly combined. 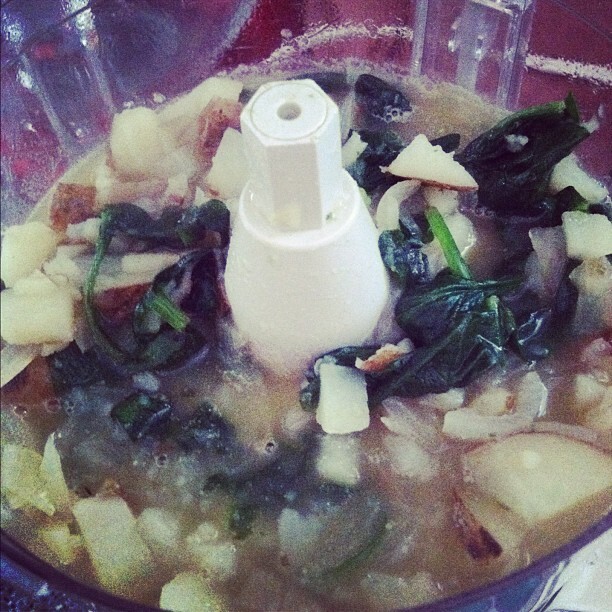 The liquid mixture with the mashed potatoes in the middle. Weird, but it works. In another bowl, sift sugar, flour, salt, nutmeg and baking powder together. Flour from my mom was a Christmas present! Add to the liquid. Dough should be soft, yet firm enough to roll (here is where you add the extra flour if you need to, gradually so you don’t add too much). This was the widest glass in my house. 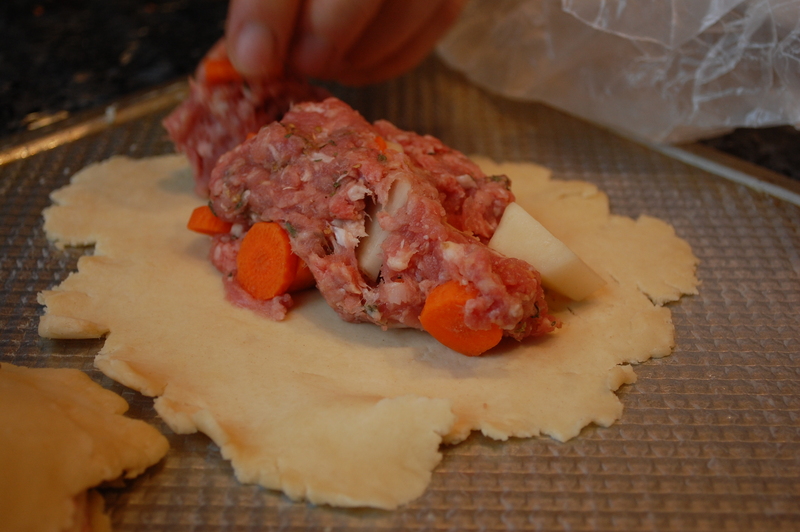 Separate the dough in two parts and roll each out to a thickness of ¾ inch. Cut with doughnut cutter and fry to a golden brown (about 10 minutes a batch, flipping halfway through). See what I mean by weird shapes? Drain on paper towels. Roll in powdered sugar or a cinnamon-sugar mixture. They look strange, but taste awesome-and that is the whole point! In my kitchen, making mashed potatoes is like making pasta-no matter how I try to calculate how much I’ll need, I always end up with leftovers. And I think plain leftover mashed potatoes are boring. So I’m always looking for recipes to use up the excess. 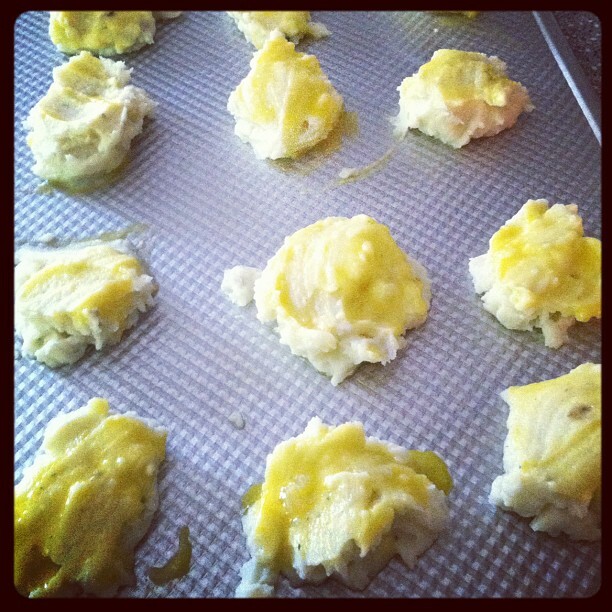 I’ve done a couple of recipes in a row with mashed potatoes so… that’s the theme for this weekend’s recipe posts! The nice thing about this recipe is that it also uses up any leftover meat you may have. It says you can fry or bake the turnovers. I did both-and of course, frying tasted better! This recipe comes from Vaughan’s Vegetable Cook Book, published in 1919. Vaughan’s was a seed company. This makes about 12 turnovers. Put the mashed potatoes in a large bowl. Add the flour, one tablespoons at a time, blending each tablespoons in with a mixer. Do that same thing with the butter-add it a little bit at a time and blend. 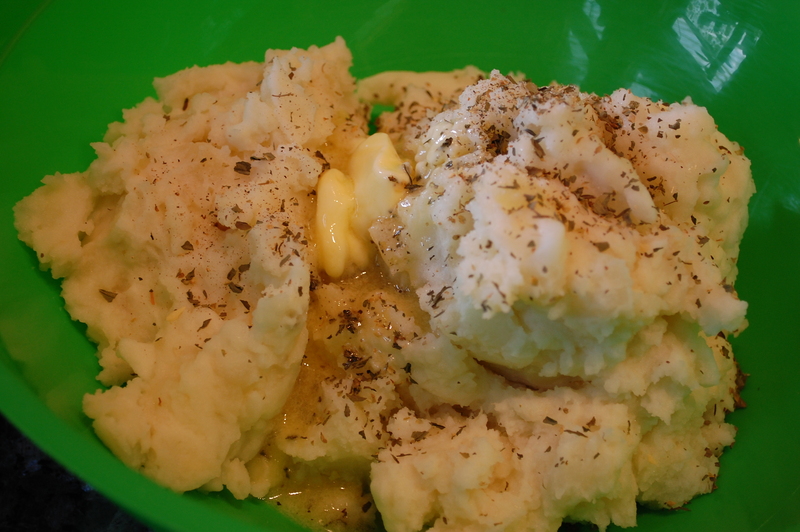 The mashed potatoes blended with flour and butter. Flour a surface, a rolling pin, a biscuit cutter, and your hands thoroughly (the dough is very sticky). Pick up the dough as best you can, rolling it in the flour until it’s easier to manage. Then roll out the dough to about an inch thick. 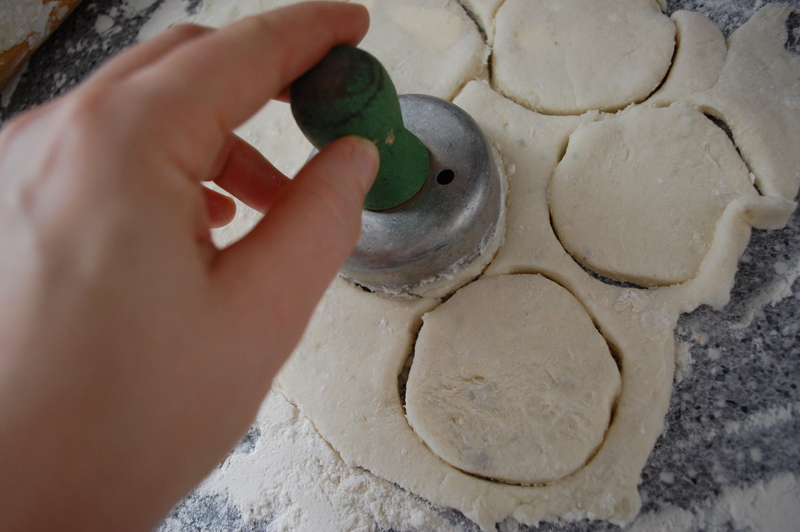 Cut circles with the biscuit cutter. 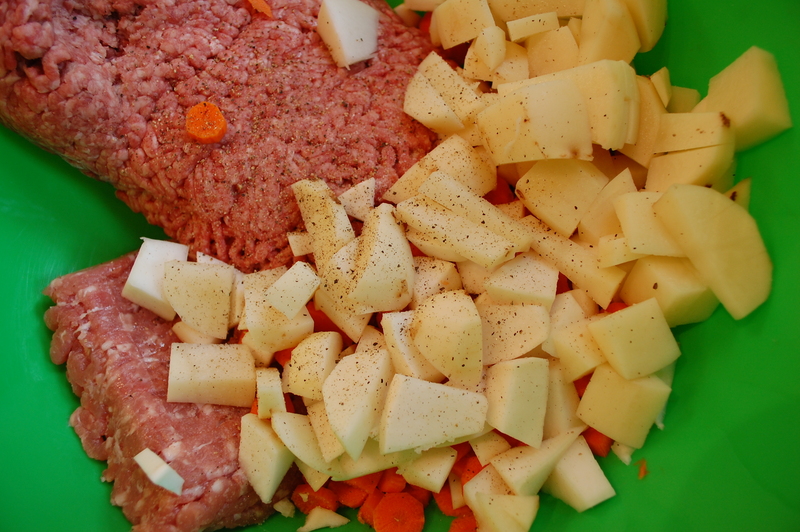 On half the circles, place about a tablespoon of minced meat. Season (I used Penzey’s Sandwich Sprinkle). Lay another plain circle on top of each meat-covered circle and pinch the edges together. If you choose to fry, heat about half a cup of oil in a heavy saucepan or skillet. On medium low, fry the turnovers about 5-7 minutes on each side or until dark brown and crispy. Lay on paper towels to drain. Baking is healthier-but frying tastes better. If you wish to bake the turnovers, heat your oven to 400 degrees. Line a cookie sheet with foil and spray with cooking spray. Lay the turnovers on the cookie sheet and bake about 20-30 minutes, until lightly brown and crispy. 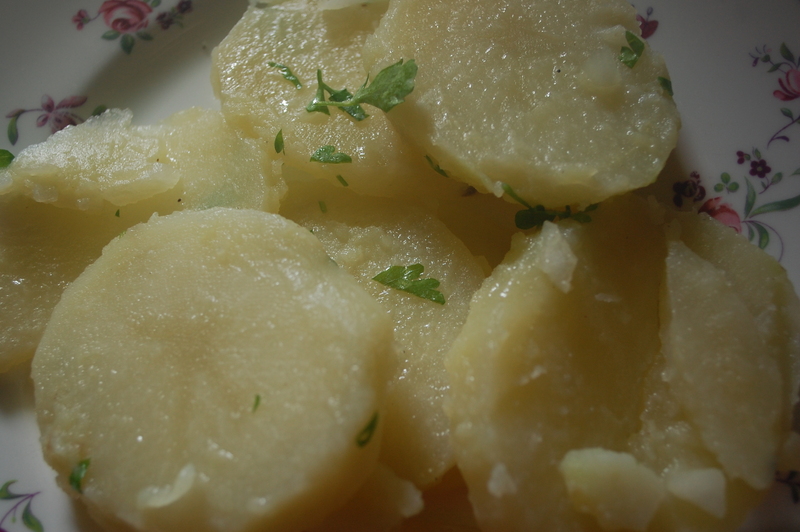 This is one of the best potato recipes I’ve ever made. It comes from “The City Tavern” cookbook, from the famous Philadelphia tavern where our country’s founding fathers once ate and talked over the business of the new United States. 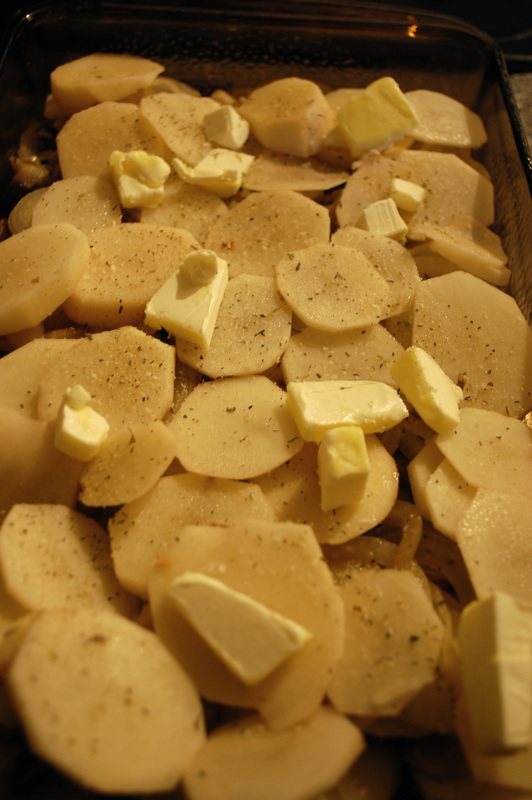 The chefs of the tavern have actually created this recipe by combining elements of potato dishes recorded by two famous colonial cooks-Mary Randolph, author of “The Virginia Housewife” and First Lady Martha Washington. This is a great weeknight recipe. The most time-consuming part is the slicing of the ingredients. Once you have that done, it only takes about 30 minutes to get it to table. Preheat the oven to 375 degrees. Heat 4 tablespoons of butter and the oil in large skilled over high heat. 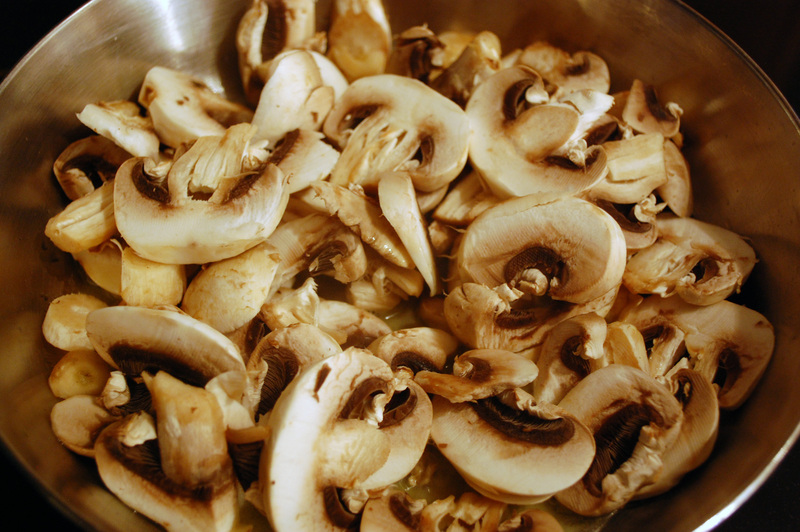 Add the mushrooms and sauté for five minutes until light brown and tender. Remove from skillet and reserve. 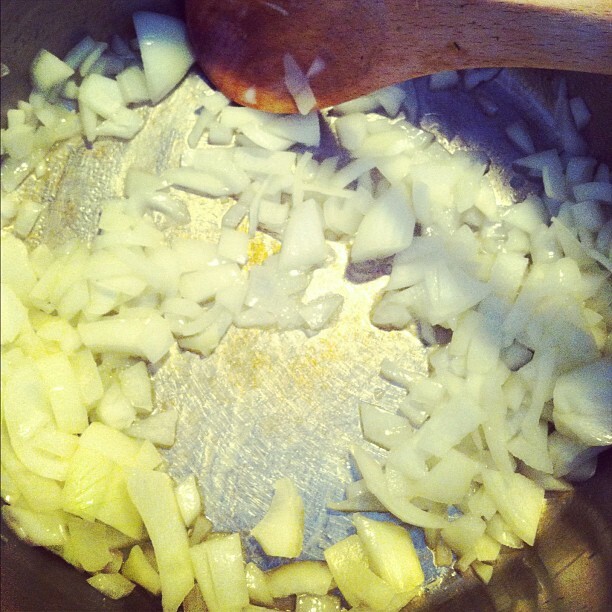 In the same skillet, sauté the onions and garlic for three minutes, until golden brown. Reserve. Pat the sliced potatoes dry with paper towels. 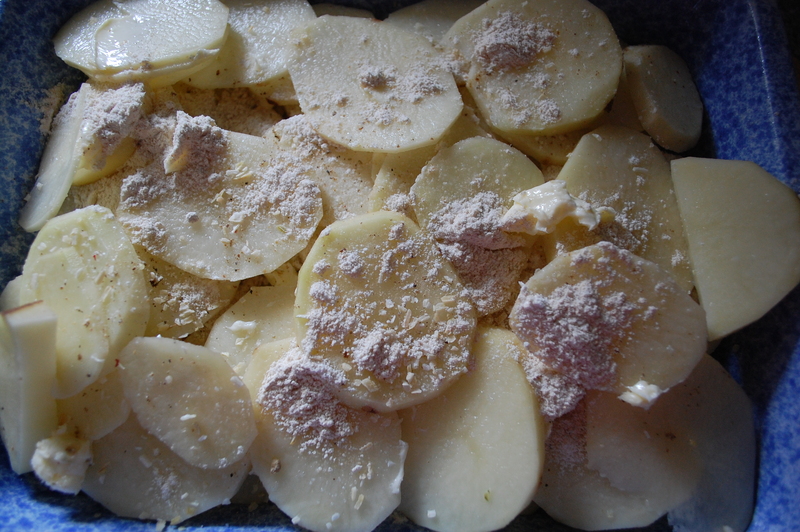 Place half the potato slices in the bottom of a large baking dish that’s been greased. Sprinkle with salt and pepper. Add the parsley. 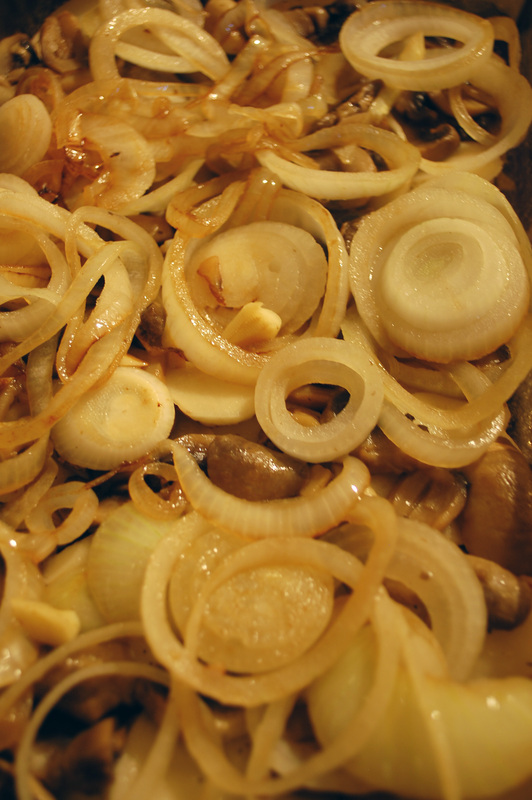 Top with the reserved mushrooms and onions. 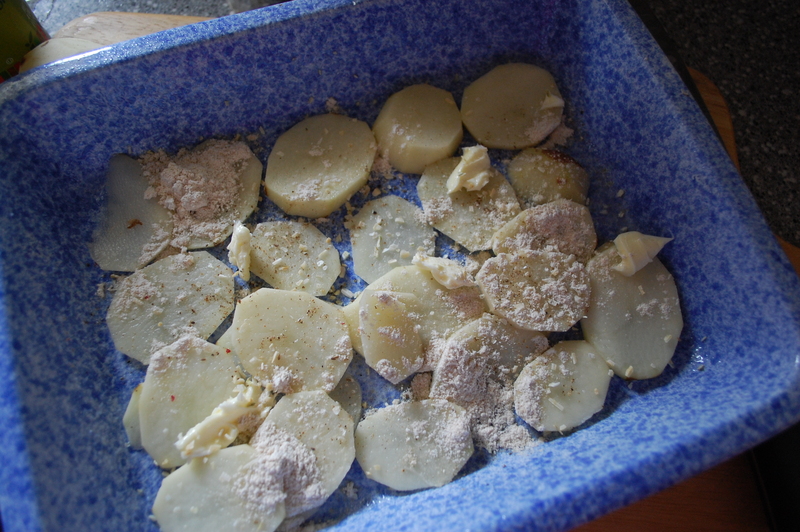 Add the remaining potato slices. Sprinkle again with salt and pepper nad dot with the remaining 3 tablespoons of butter. Bake for 15 minutes. 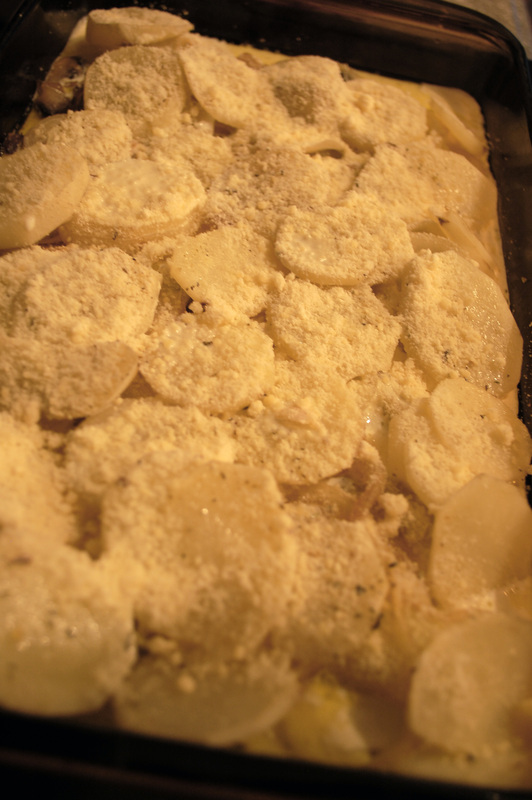 Pour the cream evenly over the potatoes, top with parmesan, and bake for another 10 minutes. I moved my rack to the lowest position in the oven so the parmesan cheese wouldn’t get too brown. When the potatoes are fork-tender, it’s ready! 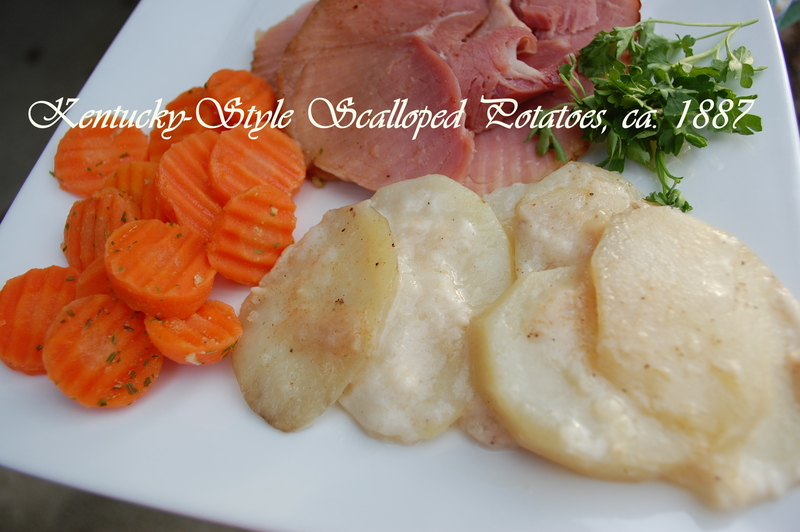 On a recent weeknight-tired of baked potatoes and frozen French fries-I went looking for a potato recipe that was a bit dressed up, but not difficult. I found this recipe in the book Public School Domestic Science, published in 1898 by Canadian author and cook Adelaide Hoodless-also known as the founder of the international organization The Women’s Institute. The wife of a furniture maker, Adelaide devoted herself to educational reform for women after her son died at the age of 18 months from drinking unpasteurized milk. Adelaide felt that if she’d been better educated, she could have prevented her son’s death. 95 years later, the WI has more than 208,000 members across the globe! After you’ve made the mashed potatoes, mix in whatever spices you like to add flavor (you can also add a bit of shredded cheese at this point, if you want). Beat the egg whites and yolks separately. 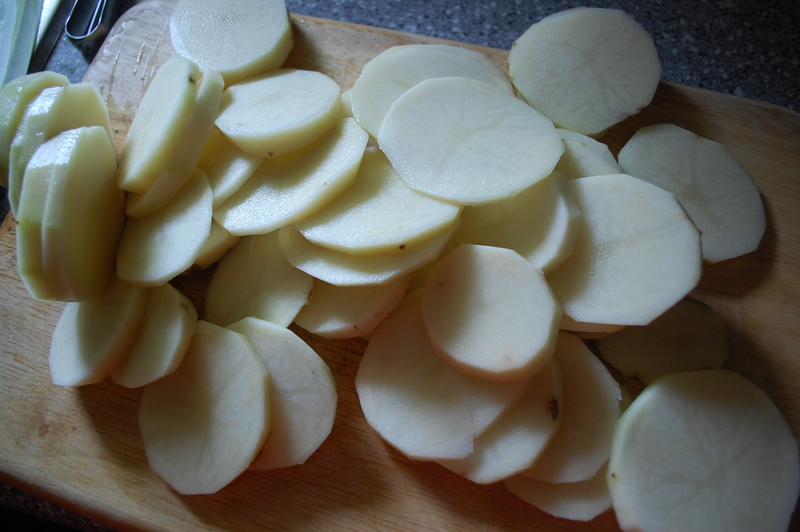 Stir the egg whites into the potatoes-this will bind them. 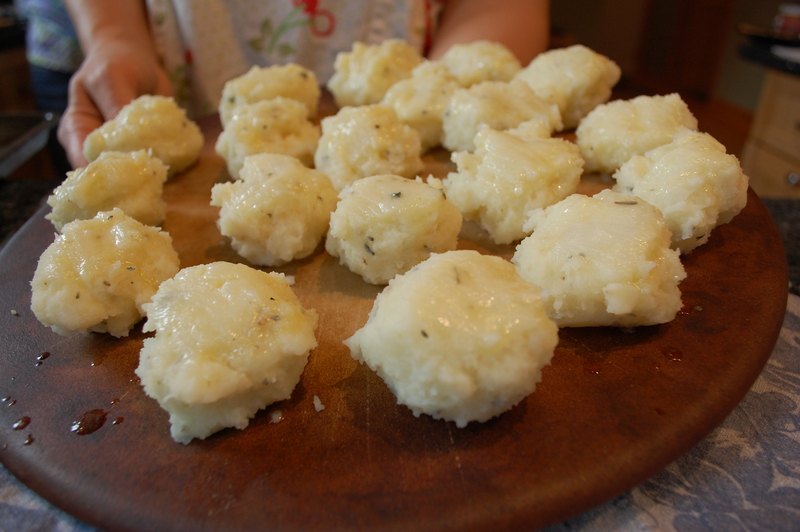 Shape them into balls or round patties on a greased cookie sheet. 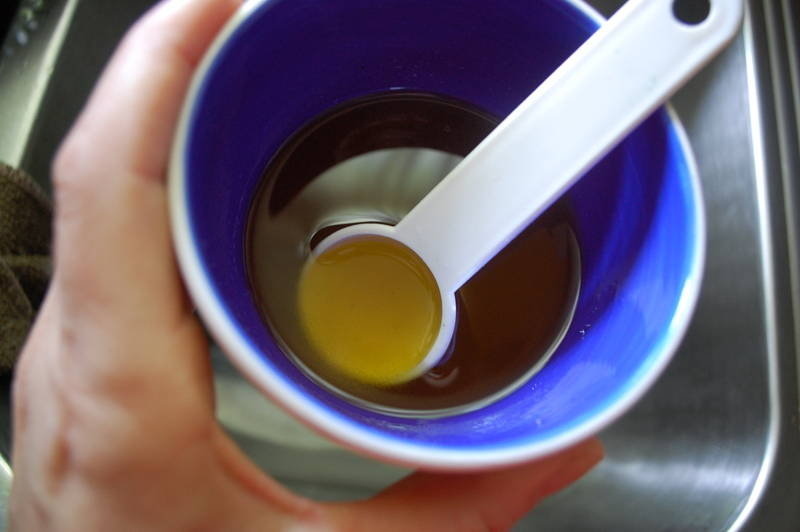 Brush the outsides with egg yolk. Bake at 400 degrees for about 15 minutes or until the outsides just start to turn a little brown. That’s it! You can serve these with some shredded cheese on top or a little butter or even a side of gravy. They make a great side dish. Enjoy! Confession: I have never, ever been able to recreate the magic of homemade hash browns, potato fritters, or potato pancakes. So why on God’s green Earth did I suddenly decide to go forward with this recipe? Three words: Leftover mashed potatoes. 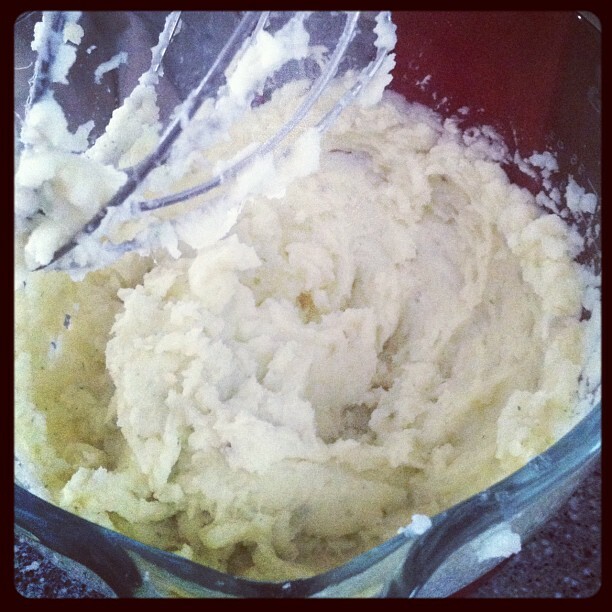 I don’t know about you, but I can never seem to measure how many mashed potatoes to make to feed my family exactly. And once the gravy is gone, the leftovers sit there in a lump in the frig. In the heritage kitchen, nothing went to waste and that’s the example I try to follow. 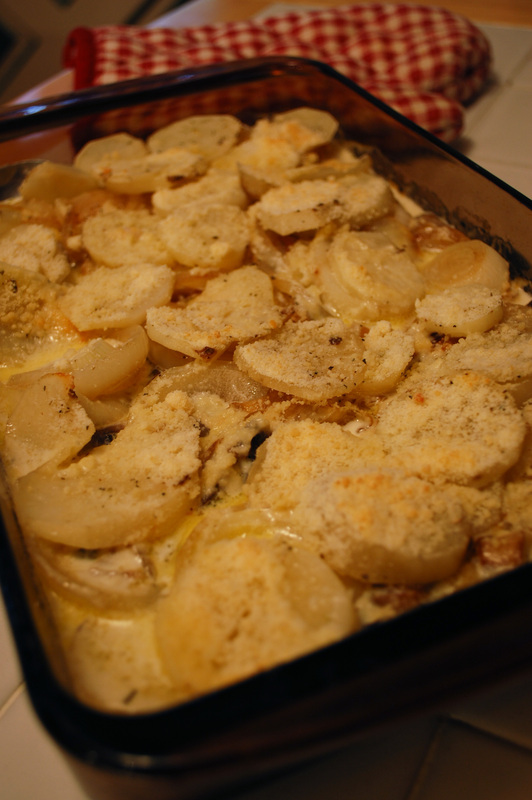 Thus, I thought maybe a heritage recipe would finally be the answer to my leftover cooked potato curse. 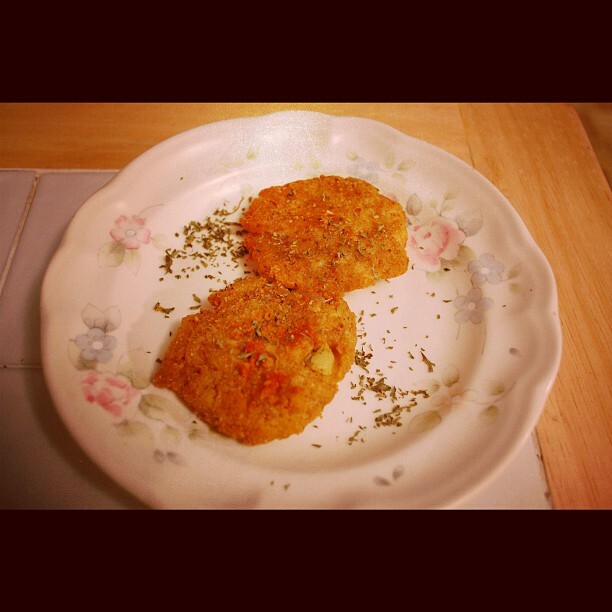 I found this recipe in the cookbook “New Vegetarian Dishes” by Venus Bowdich (what a name! ), published in 1892. Place olive oil and butter in pan, heat over medium heat. Meanwhile, mix all the other ingredients in a medium bowl. 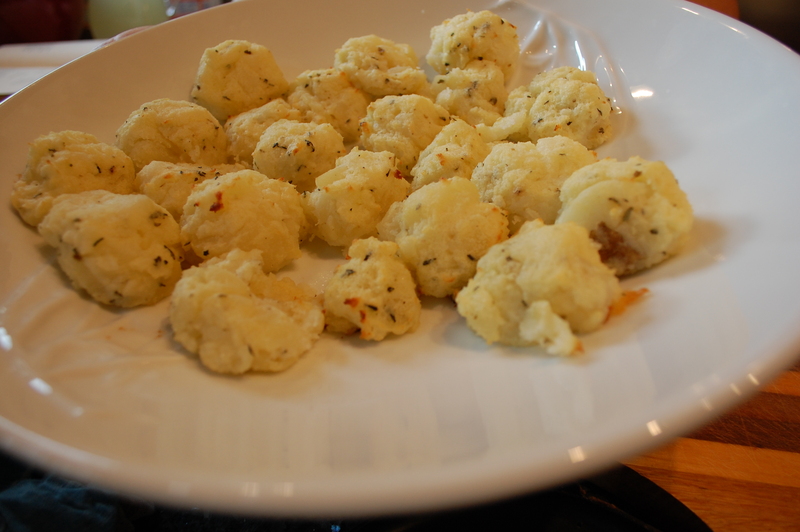 When the oil/butter is ready for frying, form potato mixture into small patties, no bigger than the palm of your hand. Place them in the oil and let them fry on each side for about 10 minutes or until brown but not hard. Use a slotted spoon to remove the fritters from the pan and drain on paper towels. Enjoy! 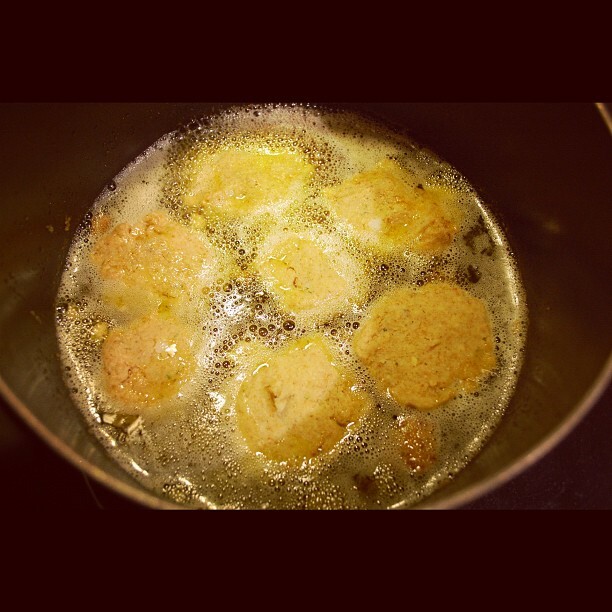 I will tell you that I first tried forming the fritters into balls but they did not cook properly. I found the flat patties to hold up to the oil/butter much better. These are so delicious! And I was so proud of myself for finally getting a potato pancake right!